This is probably Transition Bath’s busiest month of the year with the launch of Bath Green Homes. We have 16 homes open during the open homes weekend of 27th/28th September and 20 events running throughout the autumn. This month’s bumper newsletter also includes a diverse mix of articles including Bath & West Community Energy, local food project updates, Cleveland Pools, North-South cycle transport, the energy efficiency of apple preservation, and energy use in schools. We would also like to encourage anyone who comes across a suitable newsworthy item for our newsletter, or would like to write an article for us, to please get in contact? 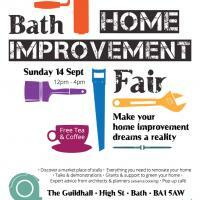 Bath Home Improvement Fair this Sunday! Start feathering the nest for winter at Bath Green Homes’ Home Improvement Fair – this Sunday 14th Sept at the Guildhall in Bath. Whether you are doing a DIY project, looking for professional help, or just want to get some ideas on how to make your home warm and beautiful, there is a lot to explore. Stalls, local suppliers, talks from experts, free consultations with an architect or B&NES Council Listed Buildings Officer (booking required) – all with free entry and free refreshments! 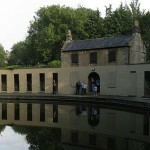 Check out the great programme of talks and book your free advice session on www.bathgreenhomes.co.uk/BHIF. Open Homes Weekend just weeks away…. We’re very excited about this year’s Open Homes Weekend, with a fantastic line up of homes opening their doors on 27th & 28th September (12pm-5pm). From Georgian to Victorian, 1940s to new build, low cost to high tech – this year’s line up has something to inspire everybody. 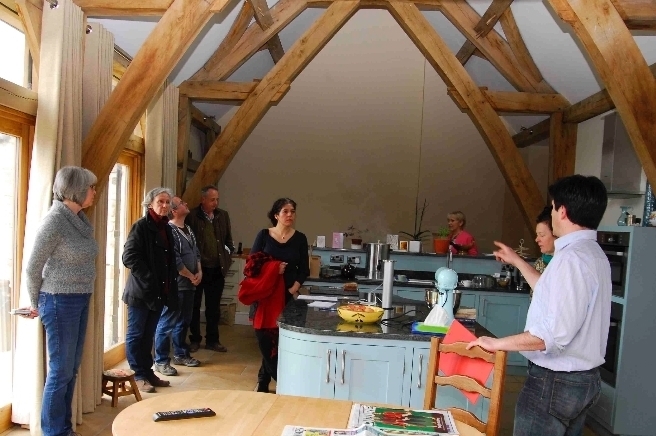 Also don’t miss the Bath Green Homes Exhibition running throughout the weekend at the Building of Bath Collection – featuring free listed building consultations from B&NES Council and free advice on eco-refurbishment. There are also 20 events programmed throughout September to November – check them out and please spread the word! Why not invite a friend along to Bath Green Homes who hasn’t been before? You have to be quick if you want a grant to help you with solid wall insulation – since our May newsletter where we encouraged you to look at the government £6,000 grant for solid wall insulation, the program has been closed because it was too popular! Luckily B&NES Council has come to the rescue and is able to offer grants of up to £7,000 for solid wall insulation and other energy efficiency measures. The first step is to call the Council’s brand new B&NES Energy@Home Advice Service – on Freephone 0800 038 5680 – which which offers B&NES residents free, local and impartial home energy advice. If you are thinking about solid wall insulation there are examples of both any internally and externally insulated homes open on the Bath Green Homes Open Homes weekend. 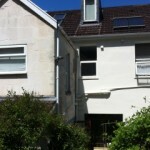 British Gas are also still offering free non-means tested cavity wall insulation. Further information on both programs is available here. Bath & West Community Energy wins national awards…. 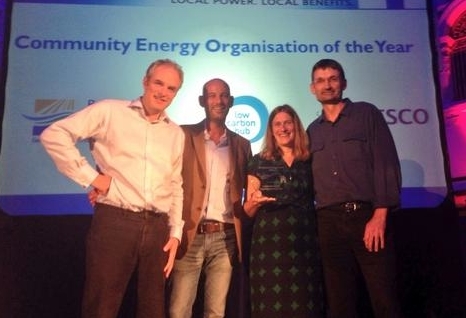 Congratulations to Bath and West Community Energy (BWCE) for winning ‘Community Energy Organisation of the Year’ at the annual Community Energy Awards in Oxford last week – as well as to BWCE Chair Pete Capener, who also won ‘Community Energy Leader of the Year’ at the same event. More details here - and well done all! This national recognition comes just weeks ahead of BWCE’s biggest share issue to date to raise £1.6million for a new 2.34MW solar array at Wilmington Farm near Marksbury, Bath. All are welcome to join BWCE for its Share Offer Launch, Wed 17th September, at The Guildhall, Bath, 6.30-8.30pm. Delicious home-made food will be on offer as well as locally pressed apple juice, and you can find out how you can invest and become part of this latest exciting BWCE community owned renewable energy project. Cleveland Pools: Is there a more environmentally friendly alternative to gas? Congratulations to the Cleveland Pools Trust on gaining initial development funding for the £4.1 million restoration of the pools. Given the initial proposal was to use gas for heating we thought we would look at some more environmentally friendly alternatives for the main heating system for the pools – air and water (River Avon) source heat pumps, and woodchip biomass boilers? It appears from our analysis that all three offer lower cost and more environmentally friendly alternatives to gas. 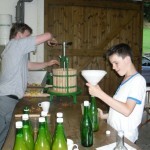 Just a reminder, if you have too many apples this season Transition Bath has both a press and a juicer available for loan, and offers training courses. Our Energy Group has also been calculating whether pasteurisation or freezing is the most energy efficient way to preserve your juice. The answer is that freezing is about twice as efficient, but neither use that much energy and certainly a lot less than the food miles incurred if you buy fruit juice from the supermarket! We would encourage you not to let your spare apples go to waste, more information is available here. Over the last couple of months, Nat has been leading foraging walks on alternate Saturdays and Sundays. From now on, he’ll be organising walks on demand! If you’re interested in going on a walk then get in touch to arrange one, it’s still free of charge. Now’s the perfect season for getting wild and ‘feral’ fruits and nuts. Nat can be contacted on 07749984408. 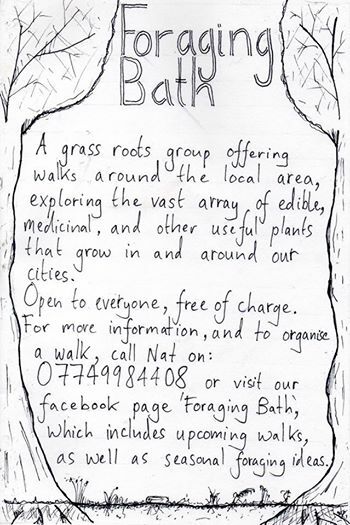 For the latest information, follow the Facebook page Foraging Bath. Sophie Kirk from B&NES Sustainability Team has been developing a Local Food Strategy to address food sustainability, rural economy, health and nutrition and related issues. Virginia Williamson, convenor of TB’s food group, has been a member of the Steering Committee. The Local Food Strategy is now out for public consultation. Please look through it and submit your comments before 5th October. As part of a weekend of city-wide events to mark the United Nation’s International Day of Peace, Sunday 21st September will start with a Dawn Picnic (weather permitting!) at our community nuttery project in Smallcombe. Come along to the nuttery at 7.30 am, with your picnic. There’ll be a camp fire for warmth and to do some cooking if you’d like. Thanks to all of you who completed the survey in July’s newsletter. There results weren’t conclusive, but the Trondheim-like cycle lift proved the most popular choice. We had one unanimous answer to the question of whether the council should look at north-south pedestrian and cycle transport in its Transport Strategy, 100% of you said yes – we will be contacting the council on your behalf to ask them to address the problem. The comments provided by those who completed the survey are perhaps the most interesting; head over to our website for a writeup of the results. Congratulations to B&NES Council in helping all 78 state schools in the area reduce their gas consumption by a total of 18% last winter. Although much of this reduction came from the mild winter, a significant proportion was as a result of project work carried out over the course of the last year with involvement from Transition Bath. We have provided a long write-up of how the savings were achieved here. 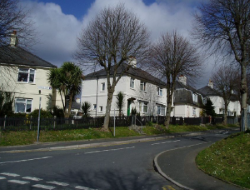 In August Transition Bath was invited by social housing provider Curo along with residents from Bath’s Foxhill estate to visit North Prospect in Plymouth to see the impact of a regeneration scheme similar to the one being proposed for Foxhill. At North Prospect the local social housing provider was in the process of demolishing 800 homes and replacing them with 1200 new homes. Although not identical to what is being planned at Foxhill it was a useful visit and allowed us to understand the impact of this type of redevelopment and the challenges in rebuilding a community afterwards. We have a long write-up of the visit on our website. LED Lighting Project: Our new LED lighting project (replacing halogen Downlighters) is progressing well. Bath Central Library has kindly agreed to manage the ‘try-before-you-buy’ kit. We now hope to launch it in October – so we will provide more information on the project in our next newsletter. We would like give all of you who are still using inefficient halogen bulbs not excuse not to upgrade to LEDs!!!!!!!! Thermal Imaging: we are hoping to launch our thermal imaging project again in October as the weather is getting colder and it becomes suitable to start doing surveys again. We will be looking for volunteers to be trained to provide surveys – more information in October’s newsletter. ← Is your tradesperson suitably qualified?